The DCM Medium Die Cast Area Light is designed for general-purpose area lighting. It is the perfect choice for lighting large open areas for safety and security. Wide roadway applications, parking areas, or even wall mount applications for security lighting are all suitable applications for this fixture. 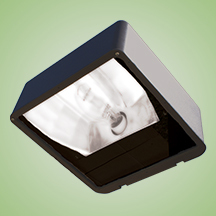 The medium size and multiple mounting options make this fixture economical and versatile. Made with a state of the art high performance reflectors that use high gloss components to achieve precise photometric distributions The fixture is a full cut-off light fixture and is Star Light Friendly in the horizontal position only. Available in 175W thru 400W standard metal halide, pulse-start metal halide, and high pressure sodium. Comes standard with a 4KV pulse rated mogul base socket. Each 60HZ CWA multi-tap or 480V ballast is pre-wired and installed for convenience. Standard mounting options include 2”, 8” and 10.75” Straight Arms with internal bolt guides for square and round pole mounting on shoebox models. 2” Adjustable Slip Fitter and Yoke Mount available for floodlight models. Additional mounting options are available.